Lotus Tirta Seminyak Hotel & Villa is a homey property offering affordable accommodation options for travellers wanting to be centrally located when visiting the island of Bali. It is a strategic base with a carefree ambience and its own brand of gracious Balinese hospitality. The hotel & villa is small, yet extremely comfortable, with just 14 standard rooms and supporting guest facilities. Three additional private Pool Villas with multiple bedrooms are also available to anticipate the needs of families on a budget. Breakfast is served daily at a casual street-front cafe with an upstairs terrace featuring timber bench tops. Light refreshments and cold drinks are also available during the day. The swimming pool is a refreshing body of water edged by reclining sun beds and a border of tropical plants. 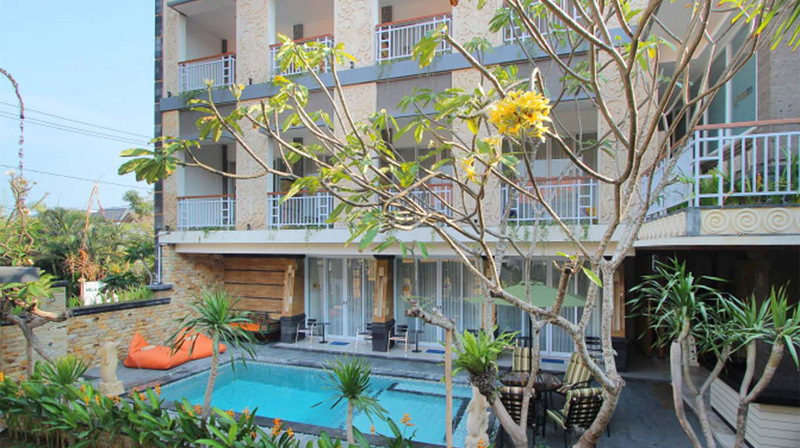 Lotus Tirta Seminyak Hotel & Villa is part of Bali’s lively tourism district. It is near the beach and within easy walking distance to many cheap and cheerful places to eat. There’s also an energetic nightlife scene just a short taxi or motorbike ride away by for guests looking to party. Lotus Tirta Seminyak is taken from the philosophy of the Lotus, which has a very religious meaning. It is believed to be a symbol of the pure source of energy in the human body, the epitome of beauty, prosperity, eternity and spirituality. Meanwhile in the real life, the Lotus is also a flower that grows upon water or mud without being touched by the water or mud itself.